Despite being a very small part of the federal budget, NASA provides virtually all of the nation’s viral marketing buzz as Americans continue to be fascinated by the space odysseys of the NASA program. Today, the explosion of social media makes it easy for people to discuss, blog, comment, and share their opinions on the latest space spectacles with their social media networks and the entire digital arena. Still, many wonder how NASA is able to maintain such a strong online following while the government struggles to get any Internet respect. TheAtlanticWire.com recently reported on how NASA keeps building the viral buzz. First of all, NASA avoids getting a stuffy and stodgy government image by strategically spotlighting its cool and stylish employees. 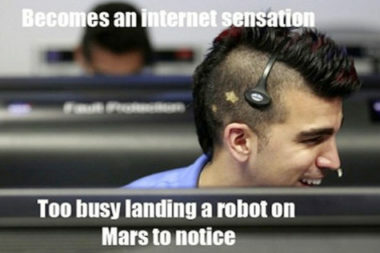 The most recent has been Bobak Ferdowsi, AKA Mohawk Guy, who’s turned into an Internet meme, gaining more attention for his habit of getting a trendy new haircut for every mission than for his role as NASA’s activity lead. Millions tune in to each mission’s live stream just to check out his latest hairstyle. Then, these Ferdowski fans rush to discuss and share videos of his new ‘do on their social media networks and blogs, generating enormous viral buzz for the NASA team. In addition, NASA leverages its team’s ability to create cool content by broadcasting their antics and activities on top-quality live video streams. They continually optimize their technology to ensure that they’re able to handle extremely high Web traffic and provide an ideal video-viewing experience for everyone, every time. Finally, exploring space is inherently cool and it creates a sense of unity among Americans. NASA plays up the joy of discovery by airing video of employees smiling, celebrating, and bonding over their latest space achievements. This excitement is contagious and extremely engaging, which is why NASA’s mission to go viral has been such a success. To learn more about using social media and video to create viral buzz, contact MDG Advertising. At MDG, our 360° marketing approach uses just the right mix of traditional and online media to reach your brand’s marketing goals. While some industries may fare better in print and others online, we strive to create a balanced approach where digital and traditional advertising efforts support each other and your marketing message is tailored to the medium. To stay on top of the latest viral marketing trends that will make an impact for your brand, contact MDG Advertising. Read more at the Atlanticwire.com.